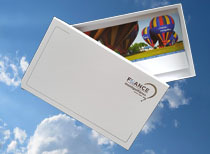 Come and meet us at for a balloon ride over the Fontainebleau area to rediscover the true meaning of nature, as once enjoyed by Alfred Sisley and his other impressionist friends. Fly above the emerald green forests, home to wild boar and deer and hunting ground to the Kings of France - above rivers and romantic little villages….less than an hour away from Paris. The total excursion time is three hours with a flight time of approximately one hour. 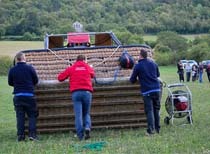 This includes the balloon preparation and inflation, the flight, the traditional "toast aux Aéronautes" at the landing and the return by vehicule to the starting point. 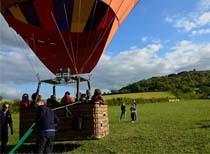 Balloon rides are scheduled everyday, morning and evening when the wind is calm, seven days a week from April to November. You may buy a ticket and reserve your seat via this site or you may book at the last minute by telephone, especially on weekdays. We can pick you up at the local train station in Fontainebleau. By train from Paris it's only 40 minutes, departure from the Gare de Lyon train station to Fontainebleau. - The rendezvous with your pilot at the Château of Fontainebleau. - The transfer to the take-off site. - The pre-flight briefing and balloon inflation. - The flight for between one hour and one hour fifteen. - At the landing, the deflation and putting the balloon back in it's bag. - The traditional Aeronaut's toast and diploma. - The return to the meeting point with our ground crew and vehicles. Count between 3h00 and 3h30 total excursion time.